Wilbur Ross, left, collects companies, and that gives him the resources to collect art, too. Included in his collection is Rene Magritte's “Hegel's Holiday,” far left. Understanding the supplier business is child's play compared with trying to grasp the meaning of one of Belgian surrealist Rene Magritte's bizarre paintings. 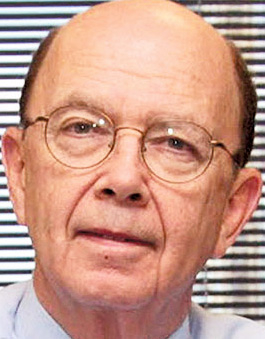 But Wilbur Ross, the billionaire who controls the giant International Automotive Components Group, enjoys the nuances of both. Ross is a collector of supplier companies, and also owns 25 Magrittes. He has gotten a lot of attention lately because of a high-profile Magritte exhibition currently at the Museum of Modern Art in New York. Ross' art collection has been valued at $150 million, and the Magrittes are said to account for about $100 million of that. One picture, called "Hegel's Holiday," is of a glass of water perched atop an open black umbrella, and Ross opined to a Forbes interviewer that the work is about contradiction and raises questions about our basic idea of water. One of the MOMA Magrittes Ross owns, "La Parure de l'orage," depicts a ship wrecked in a storm while white collagelike characters stand on the shore. "Are these refugees from the ship? Or are they standing there and watching the ship get wrecked?" Ross asked his Forbes interviewer. "You can't be sure of what's going on. It captivates your imagination."